Though it has some startling moments and a few fun sections, it's mostly just a mediocre version of a mediocre game. The game popularized a new genre, which video game players call "survival horror" and PC game players call "Alone in the Dark clones." Dino Crisis was one of the many games that followed the Resident Evil formula to the letter - its main selling point being that it was from the same designers. 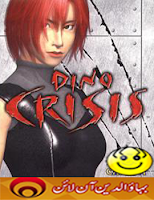 Almost a year and a half after its release on the PlayStation, Dino Crisis has been released for the PC. And though it has some startling moments and a few fun sections, it's mostly just a mediocre version of a mediocre game. The primary difference between Dino Crisis and Resident Evil is the story. Whereas Resident Evil took its setting and its story from Night of the Living Dead, Dino Crisis takes its setting and story from Jurassic Park. You play as Regina, part of a military rescue team sent to a top secret research facility to investigate an accident. The facility, in which a new form of energy is being researched, is located on an island. Something has gone wrong, and the island has been overrun with dinosaurs. In fact, the plot is so much like Jurassic Park that late in the game, one of your teammates exclaims, "It's just like that movie!" Your team isn't much help, needless to say. Other than the story, the game is identical to Resident Evil. You run around the research facility while picking up items, shooting things (dinosaurs, in this case), and solving puzzles. The game is played from a third-person perspective, and the camera angles change to create suspense. 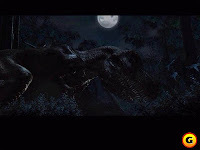 As in most games that borrow the concept of Alone in the Dark's cinematic camera angles, much of the suspense in Dino Crisis comes from the fact that you simply can't get a good look at things that are attacking you. Unfortunately, the winding, narrow corridors of the facility aggravate this issue and can make the combat frustrating. You'll be grateful for the few scenes in the game in which the camera actually trails behind you. The graphical problems of Dino Crisis are made worse by the fact that the game does little to take advantage of the superior PC hardware. It looks like an old PlayStation game. The characters are blocky, and the backgrounds are pixilated almost beyond recognition at times. Furthermore, the backgrounds occasionally slightly shake, and textures move like liquid. This irritating effect is not unlike the jittery animation found in the cartoon show Dr. Katz: Professional Therapist, and it may make you take those epilepsy warnings seriously. Like Resident Evil, the course of Dino Crisis is basically a series of door puzzles interrupted by the occasional fight scene. The door puzzles in this case are uniformly easy - when you find the key to open a new area, it will be very obvious where to go next. 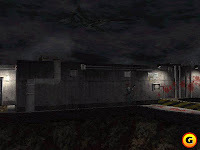 And where Resident Evil would often give you some sort of exciting sequence to break up the monotony, Dino Crisis doesn't give you much to do other than run around the facility looking for keys and codes to open new areas. The worst parts are the crate-pushing puzzles. For some reason, Regina can push a crate only once, and once it's pushed, it's stuck in its new locale. One crate-oriented maze in the latter section of the game can actually become a premature end, and the weird save-game function (you can save only when leaving certain rooms) makes the game's occasional dead ends all the more frustrating. The combat isn't much better than the puzzles. The dinosaurs act exactly like the zombies from Resident Evil, only they're faster. Shoot them a few times, and they'll fall down. But they might get back up again! This behavior makes sense in the undead, but it's less creepy with a big lizard. You'll also notice very few distinct types of dinosaurs. Your primary opponent is always the same dino, a sort of generic large lizard-looking thing. And while your first encounter with a Tyrannosaurus will give you a good start, your second and third probably won't. Besides, you don't actually need to kill these beasts - you can always just run around until an escape route opens. Had Capcom decided to put more effort into a PC version of Dino Crisis, the game would have been slightly better. It would certainly look better, and all the standard problems with video-game-to-PC translations, like the absence of a save-anywhere function, would have been absent. But it's doubtful that Dino Crisis would have been more fun. The problem with Dino Crisis is that even though it is an exact replica of Resident Evil, it lacks the creepy atmosphere that made Resident Evil so popular in spite of its problems. Like Resident Evil, it has bad voice acting and frustrating camera angles. Unlike Resident Evil, it isn't scary. 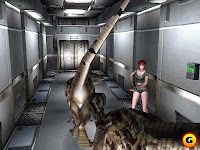 If you love dinosaurs and you love Resident Evil, you'll likely get some satisfaction from Dino Crisis. But those players outside of that limited demographic will find the game to be generic at best.